I don't think Hal Johnson is a very unusual sort of a guy. He's just -- well, the average American citizen and family man, the kind that are the backbone of the nation. I admire him and like him. I like his attitude. Until, that is, he gets behind the wheel of an automobile. At that point he changes. He changes from a careful, considerate citizen—to a menace. –"Driven to Kill," 1948 driver's safety film. Hal Johnson lives in New York, where he writes books, sells comics, and plays Dungeons and Dragons. 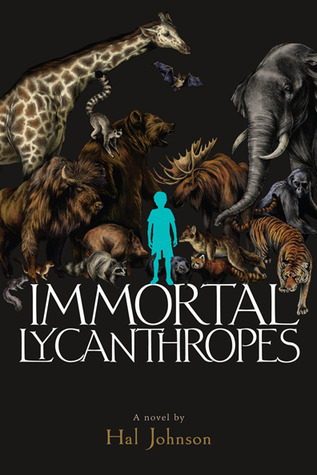 Where did you get the idea for Immortal Lycanthropes? All my good ideas I had when I was a little kid. Back then I’d been drawing pictures of people that could turn into different animals—badgers and otters and such—and imagining what would happen if they had to fight. But the problem is that there would be no reason for them to fight it out as animals—they’d just shoot each other, and the shrew would be just as tough as the lion. This was unacceptable to my young brain, so I made up the proviso that the animals could only be killed by each other in animal form, by their teeth or claws of horns or hooves. Bullets would barely slow them down. This made me happy enough at the time, and I drew a bunch of pictures that probably don’t exist any more of people turning into weasels against the backdrop of some sort of post-apocalyptic landscape. Then I forgot all about the concept for a couple of decades, until I was pitching book ideas to an editor, all of which caused him to purse his lips and shake his head, sadly. In a fit of desperation I threw out “immortal lycanthropes.” The rest is history. But the rest is always history. That’s what history is, the rest. 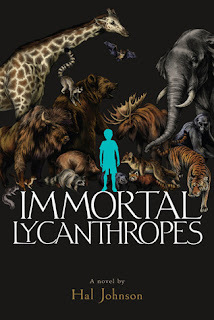 Did you hit any snags while writing Immortal Lycanthropes? What were they and how did you fix them? The big snag came right at the beginning. I fretted a lot because the idea of immortal lycanthropes—it doesn’t make any sense, does it? Where do they come from? What are they after? What are they for? 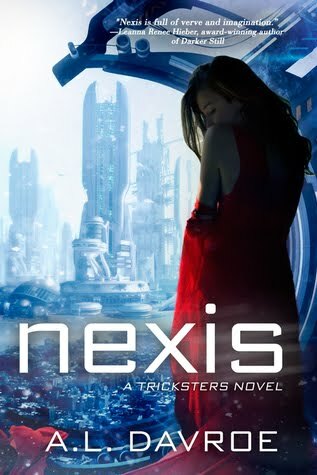 I knew my basic story, with Myron trying to find himself while hunted from all sides—but I didn’t know what kind of world the story could take place in, and I consequently spent a lot of time chewing my nails and not writing. What I finally figured out was that the self-styled immortal lycanthropes should only be one small part of this world. Once I realized I could throw in Rosicrucians and Freemasons, and a whole secret history of the world with the lycanthropes snaking through it but not controlling it, everything fell into place. They think they’re special, but no one else does. They’re not even the only immortals in the book! Suddenly I understood what the immortal lycanthropes were for, and it’s the same thing we’re all for. Nothing much. The whole tone of the book came from that revelation. Once you have the tone, all you have to do is just make up a bunch of stuff, so the rest was more or less cake. The dirty little secret to writing is that it’s really easy. There’s the whole hurdle of literacy to get over, but once you can write, actually doing it is as easy as an exercise. Which means being an author is trivial. Of course, becoming the author you want to be—writing the thing you want to write—is far from trivial. The whole question hinges on what you want to write. Almost all advice to writers you’ll read should be taken with a grain of salt because it assumes you’ll want to write one kind of book, the kind that advice is geared towards. Clarity in writing is usually fine, but not necessarily if you're a modernist. "Show, don't tell" is bad advice if you're writing a fable. These are pretty extreme examples, but the differences between literary fiction and a Doc Savage pulp are large enough that Thomas Pynchon would be fired if he tried to ghostwrite for Kenneth Robeson. Stone-cold fired. So the only real advice is to write the kind of thing you want to write; if you are unable to write it, either change what you want to write, or change yourself until you become the kind of person who can write what you want to write (which can be a terrifying process). Just don't stop writing, because if you do, all other advice is useless. There are so many possible answers here—I love almost as many books as I hate. But the true answer is 5 Novels by Daniel Pinkwater. It’s an omnibus, so that’s kind of a cheat, but I am naturally dishonest, and don’t care. I first read Pinkwater in fourth grade, and he’s had an immeasurable impact on both my life and my writing. All of his books have a similar plot—a kid who ranges from vaguely dissatisfied to full-on alienated gradually discovers another world that may be terrifying and may be beautiful but is at the very least not super-lame. I use “another world” in its broadest sense, as depending on the book it could be another dimension or it could be just a community of like-minded weirdoes congregating in all-night diners. The possibility of crossing over into any of these options sustained me through many a long and anxious night as a child, and years later I realized that almost all Pinkwater’s books can be read, with differing degrees of ease, as allegories for a mystical experience I’m still chasing after. Myron’s escape from the humdrum world of suburban high school to a world of secret societies and were-mammals is a direct ripoff of Pinkwater’s plots. Many children’s authors before Pinkwater invoked two worlds—Barrie, Milne, Baum, Carroll—but in all of these the other world was if a metaphor for anything a metaphor for childhood or a child’s imagination, something that had to be abandoned ultimately if a child was going to reach adulthood. Pinkwater, in contrast, exploded the child/adult dichotomy by looking ahead to adulthood and offering an alternative. The alternative could be art and it could be time travel, but it was at the very least an option. Anyway, 5 Novels contains three of his four best books, and two others that are just really good. Which one of the characters in Immortal Lycanthropes is your favorite and why? Everyone assumes it’s Arthur the binturong, because he is (my friends say) the most like me. He gets to tell the story, after all, and his name is even close to “author” (that was an accident, or at least it wasn’t a conscious decision). But really, my favorite and the most fun to write was Mignon Emanuel. In many ways she’s a classic supervillain, training an army of henchmen in her secret lair, but she seems to have a real soft spot with Myron. She lies to him and manipulates him, but she always plays fair with him. What she says she’ll teach him, she teaches him; what she says he can get away with, she lets him get away with. She’d almost seem like a decent person were it not that every time she appears in the book she has just murdered someone. All I do is read, so spilling over into writing only seems natural; but for a long time I didn’t seriously intend to be a writer. I mean, it’s not that I didn’t want to be a writer, it’s just that it sounded like a pipe dream, about as likely as becoming a pirate, a cowboy, or an astronaut. The fact that I almost never wrote anything was a serious stumbling block, but it’s not like I was practicing busting broncos, either. If I thought at all about the future, I assumed I would be a paleontologist or a drifter. Reading Jorge Luis Borges’s Labyrinths changed all that. It’s not that it made me want seriously to be a writer; it’s just that it made me write. I found copying Borges’s experimental story structures—where the story proper may be no more than summarized inside an elaborate frame narrative—extremely liberating. I’ll admit to producing some straight-up Borges pastiches I’m not so proud of, but it got the ball rolling, so to speak. You know what the rest is. With that in mind, I just finished a sad book about two girls trying to escape their miserable existences into a fantasy land; and I’m now working on a book about a magic school. It’s like Harry Potter except the person who graduates last in his class gets eaten by the devil Makes the House Cup more competitive, like. Why did you choose to make Myron, the main character, thirteen? In a way it’s the dumbest answer. I wanted to write a book for thirteen year olds, so I made the protagonist thirteen. 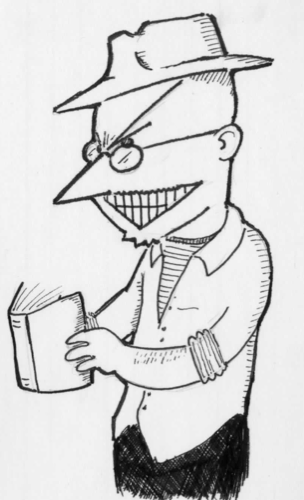 Actually, I guess it turns out people usually read books about slightly older characters, so I probably should have made him sixteen or something. But when you’re sixteen in Pennsylvania you can drive, and it would have been a different book if Myron could have tooled around in a car to wherever he wanted to go. Of course he’s actually several thousand years old. They should probably just let him drive. Do you stay true to the typical lycanthropy mythos in this book or do you have your own unique spin on it? I had read a lot about lycanthropy, its history and folklore and potential scientific explanations, and then I threw everything out the window. In part it doesn’t matter because the idea that supernatural creatures should have a consistent set of powers is hardly more than a century old. Folklore (as opposed to romantic fictionalizations of folklore) gets vampires and werewolves all tangled up. For that matter it’s also filled with dragons who fight with swords and giants whose daughters are 5’4”. Consistency is not what oral tradition is good at. But I grew up playing Dungeons and Dragons and making sure all monsters had stats. Werewolves with their 4+3 hit dice; werbears with 7+3. So I needed a series of rules that the characters in the book all would play by. These are the rules Myron needs to figure out as he goes. Phases of the moon and silver bullets are out. People do turn into animals. Everything else is a spoiler. Hal is giving away a signed, personalized hardcover with a sketch of the winner's choice (people usually pick their favorite animal, but he can also draw pirates, ugly faces, or whatever). Enter the giveaway using Rafflecopter. Hit the arrow buttons, follow the prompts, and hit the enter buttons when you're done. (You may have to log in using Facebook to do this). There will be one winner (selected by Rafflecopter). I will contact the winner via email. This contest is open to national entrants.